Labels: caption contest, made me smile, snail's pace, what is it on? "Are we facing the problems we have regarding paying for clergy because of the Clericalism of the Church of England. Do other denominations suffer less than us because they have leadership styles that draw upon all the members rather than one leader or group of leaders?" I guess the first step here is to assess what the other churches do and a quick finger in the air shows me that even where the church style is congregational we generally find that leaders (Pastor, Minister, Vicar or Elder) are paid and unpaid. Some of the congregations pay directly for their leaders and where the ability to do this is limited then the leader is unpaid, where there is money to pay for the leader/s they do - it's as simple as that! I struggle with clericalism but then again I struggle with much of the anticlerical stuff too. There was a bit of a wally who used to talk about taking the grip of the clergy off of the stuff that is Church and handing it back to the people (a sentiment with which I am in full agreement by the way). 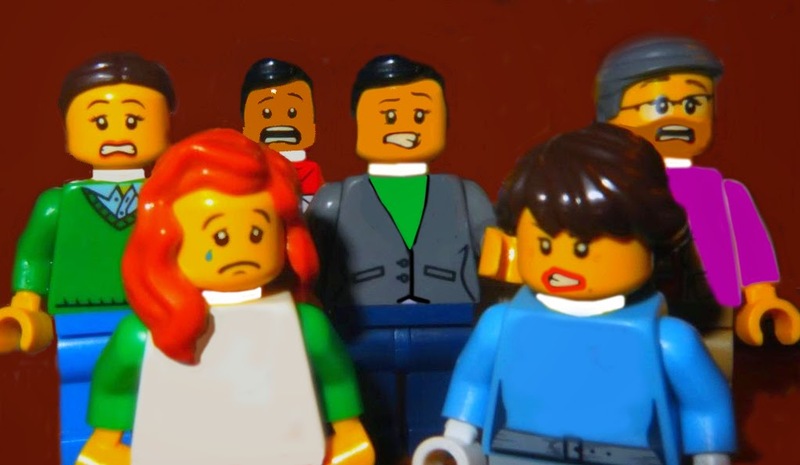 The reality was that whilst they sought a decline in ordained clergy and the empowering of members, what was happening was that we saw no coherent leadership or planning and panic mode recovery of situations where nothing had been done. I am all for leaders who lead regardless of renumeration issues but also return to the number of Elim ministers I have worked with whose one desire was to be able to stop their day job and concentrate all their time on the ministry before them. This desire to be able to do the stuff without the distraction of a day job seems to indicate that the stipend is a sound concept. Now, oddly enough, my original ambition was to be a minister who worked in the world as saw the world as my parish - as happened with the train and the church it became and the people with whom I engaged in the workplace - but I was persuaded to take the stipendiary route and have to say I have no regrets at this. The reality though is that it's not about clericalism but about paying for the privilege of having someone spin the plates, visit the sick and generally get stuck in on a 7*24*365 basis (although I do feel some sell their vocations a little short regarding this, but that's for a different discussion) and they do this because they have been 'called out' (ekklesia) to do that roll. The majority of the churches, groups, denominations and settings I have looked at pay for their leaders when they can and some do it even when they can't because of the generosity of others through relationships or by means of the Common Purse (Parish Share). Some groupings, denominations and the like do perhaps suffer less because they work on the basis that the ability and desire to pay, for this engenders the ability in others, is the key to whether payment is made and so a cash strapped church is freed from the need to pay what they cannot afford. The problem is (and I have just run someone to check as they have an unpaid pastor) is that those who rely upon lay led leadership do find that the tensions between 'ruling elders' and the rest and the lack of cohesive direction is a price that is paid when the price of leaders is not paid. A real conundrum that isn't it? So the answer to the question appears to be, "No, the problem isn't that we pay the clergy to do stuff, it's a much deeper issue than that and looks at changing church needs, the ability to pay, numbers of people coming forward to be ordained and a good many other issues. It's not about clericalism - it's much wider, deeper and demanding that that alone." With this I find more to add to the scales and more to to be considered in this evermore weighty issue. 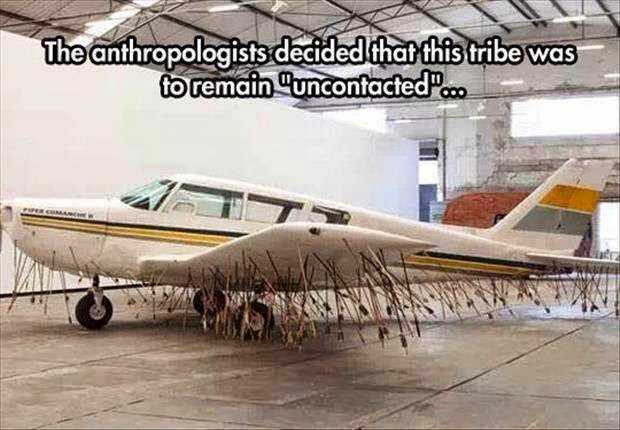 Made me smile and then made me pray: Do you think they're friendly? I have to be honest and say that this raised a smile this morning. It also reminded me of a set of heroes that I have had for many years through reading the book 'Through Gates of Splendour'. The book details the work of a bunch of men who sought to bring the Gospel to the natives of the Ecuadorian rain forests and paid the ultimate price. Almighty God, who called your faithful servants Nate Saint, Ed Mccully, Jim Elliot, Peter Fleming, and Roger Youderian to be witnesses and martyrs to the Huaorani peoples in the rain forests of Ecuador, and by their labors and suffering raised up a people for your own possession: Pour forth your Holy Spirit upon your Church in every land, that by the service and sacrifice of many, your holy Name may be glorified and your kingdom enlarged; through Jesus Christ our Lord, who lives and reigns with you and the Holy Spirit, one God, for ever and ever. Precious in your sight, O Lord, is the death of your saints, Whose faithful witness, by your providence, has its great reward: We give you thanks for your martyrs Nate Saint, Ed McCully, Jim Elliot, Peter Fleming, and Roger Youderian, who purchased with their blood a hearing for the Gospel among the forest-dwellers of Ecuador, especially the Huaorani people, and for their wives, who shared with them in their work and witness; and we pray that with them we also may obtain the crown of righteousness which is laid up for all who love the appearing of our Saviour Jesus Christ; who lives and reigns with you and the Holy Spirit, one God, for ever and ever. Amen. Happy the one whose transgression is forgiven, and whose sin is covered. Happy the one to whom the Lord imputes no guilt, and in whose spirit there is no guile. For I held my tongue; my bones wasted away through my groaning all the day long. Your hand was heavy upon me day and night; my moisture was dried up like the drought in summer. Then I acknowledged my sin to you and my iniquity I did not hide. I said, ‘I will confess my transgressions to the Lord,’ and you forgave the guilt of my sin. Therefore let all the faithful make their prayers to you in time of trouble; in the great water flood, it shall not reach them. You are a place for me to hide in; you preserve me from trouble; you surround me with songs of deliverance. under the shadow of your wings. They shall be satisfied with the abundance of your house; they shall drink from the river of your delights. For with you is the well of life and in your light shall we see light. Solomon offered as sacrifices of well-being to the Lord twenty-two thousand oxen and one hundred and twenty thousand sheep. So the king and all the people of Israel dedicated the house of the Lord. The same day the king consecrated the middle of the court that was in front of the house of the Lord; for there he offered the burnt-offerings and the grain-offerings and the fat pieces of the sacrifices of well-being, because the bronze altar that was before the Lord was too small to receive the burnt-offerings and the grain-offerings and the fat pieces of the sacrifices of well-being. Continuing with this thread there is a question that some have asked me as to whether we should be paying for them at all. This, and the discussion of stipends and common purse, need to be looked at and so we will do the 'should we be paying for clergy' question here and come back to the other issues later. Where I am are various styles of 'unpaid' clergy - these are called Non Stipendiary Ministers (NSM) or Self Supporting Ministers (SSM), Ordained local Ministers and House for Duty* (HfD). Now the word 'unpaid' (not one I use) is rather frowned upon by many and yet still used by some. Self Supporting has given way to Non Stipendiary because (they tell me). "We don't like 'non' people!" Actually I think the distinction is moot and perhaps just a little pouty - but that's me, innit? If you are not in receipt of a stipend (yes, we will discuss stipends soon) then you are 'non-stipendiary'! How difficult is this (it's up there with the 'history' foolishness!). 3. Diminishing numbers of communicant or committed members. One model, which many refer to as the 'Minster' model (but they are wrong), looks to a stipendiary minister in the central (AKA 'the big') church and 'assistant clergy (unpaid) in the other churches within the team. The problem is that we need to keep the lights on in churches and provide some form of leadership and because we demand an ordained leadership (all to do with epiclesis** and presbyteros*** - two important issues in my book - but that's for another day). As someone who is a committed proponent of all-member ministry I am a firm supporter of releasing church members into leadership positions (lay and ordained) and think this should be the force behind our actions. Sadly though, even though many ask me what's my problem as the end result is the same, there are some who seek to find people to do the job as a means of saving cash rather than equipping, enabling and releasing them because it's what we (meaning me and others like me) are called to do! It has the feel of one of Dostoevsky's comedies. The question though (at last) is should we be paying for our clergy? If we didn't pay them then we would have the issues of renumeration, housing, support services, clergy reviews and the like. If we restricted payment to those who work in the revenue generating areas, this would this cut the expenditure - a view held when I came to Lichfield diocese for there was a proposal at the Diocesan Synod to save money by cutting 'sector ministry' roles' These are the people who do non-parochial roles, working for the diocese, and so are a cost centre rather than a means of income. Regardless of how much they bring in, parochial clergy do bring something in from the members and so making sure we don't muzzle the ox that tread the grain we shoot those who don't! A very shortsighted view indeed. to maintain his wife and bring up his family in accordance with a standard which might be described as neither of poverty or riches…"
"The stipend is part of the remuneration package which is paid for the exercise of office. It reflects the level of responsibility held. This package acknowledges the dual demands in Scripture of generosity and sacrifice on both those who receive the stipend and those who raise the necessary funds." So another answer to the question, "What should we pay for?" brings forth the answer that it is there to provide clergy with the ability to give their whole time to the work of the Church without distraction from other secular employment. Having had the discussion many years back where those who were stipendiary were accused by an NSM of, "Taking money from the Church whist they (being NSM) gave to the Church for free out of their love for it!" Now this was an invitation to a punch-up and as the discussion continued one of those present asked what time they gave to the Church, the response being some Sunday services (but not all or even every Sunday) and some time during the week. They gave 'what they wanted to give'! The shot that set fire to the world around us that day was, "Not only that but you expect me to work all day and then ask me to go to evening meetings too!" Goodness me, the number of clergy who pointed out that they were working all day and going to the same meetings as them - was not a nice experience. The bottom line is that some have secular jobs and give what they can when they can (Thank You) and some work and give what they choose to give (Thank You again) when they =choose to give it. Regardless of the realities, the situation is that people are bringing stuff in and doing stuff and for that we are truly grateful. The stipend removes the external daily toil from the workload and permits a focussed and consistent application of the dogcollar's time and energies and this brings a different, but equally valid, 'Thank You'. So there is a justification for paying for ministers if it means that they are fully therefore committed to the work of the Church - but this needs to be done sensibly and sensitively for indeed it is not pay, but it needs to reflect the responsibility and workloads, pressures and challenges (mental, emotional, spiritual and fiscal) and deal with them in a mature fashion (anyone considered the secondary costs of living in some areas perhaps?). More grist to the mill - more stuff to reflect upon and get us all thinking (looking forward to some intelligent dialogue from this and the other stuff that is to come). *HfD is just a little different as we will see later. Come, my children, and listen to me; I will teach you the fear of the Lord.Who is there who delights in life and longs for days to enjoy good things? The eyes of the Lord are upon the righteous and his ears are open to their cry. The face of the Lord is against those who do evil, to root out the remembrance of them from the earth. The righteous cry and the Lord hears them and delivers them out of all their troubles. The very night before Herod was going to bring him out, Peter, bound with two chains, was sleeping between two soldiers, while guards in front of the door were keeping watch over the prison. Suddenly an angel of the Lord appeared and a light shone in the cell. He tapped Peter on the side and woke him, saying, ‘Get up quickly.’ And the chains fell off his wrists. The angel said to him, ‘Fasten your belt and put on your sandals.’ He did so. Then he said to him, ‘Wrap your cloak around you and follow me.’ Peter went out and followed him; he did not realize that what was happening with the angel’s help was real; he thought he was seeing a vision. After they had passed the first and the second guard, they came before the iron gate leading into the city. 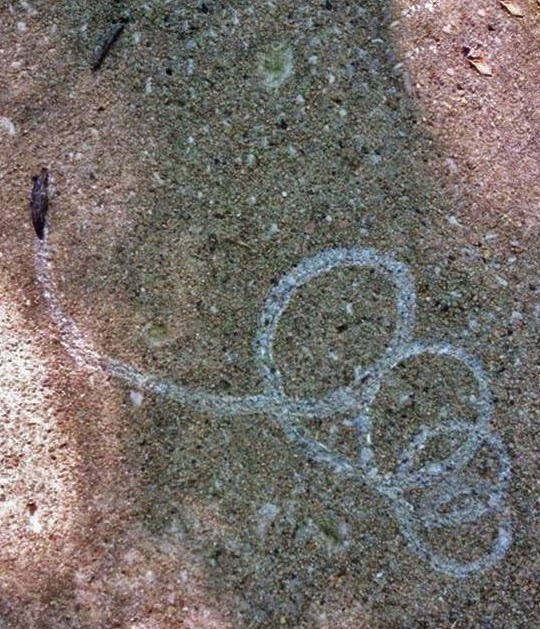 It opened for them of its own accord, and they went outside and walked along a lane, when suddenly the angel left him. Then Peter came to himself and said, ‘Now I am sure that the Lord has sent his angel and rescued me from the hands of Herod and from all that the Jewish people were expecting. in the unity of the Holy Spirit, one God, now and for ever. Amen.. This week's readings give us an interesting bag of things to look at and consider. Are you happy because you are Christ's - comforted by His love and one with the Holy Spirit? Because if you are then love each other, encourage those around you and seek to bless them! Do the stuff you do to be part of the family rather than to stand in the limelight and get praise. Be like Jesus who although being God put that aside and emptied Himself of it all to became a servant to all (not just the powerful - but everyone). The emphasis on 'emptied' is important because it's what we call kenosis - and this small word speaks pages about Jesus and His ministry because it talks of Jesus as a man who had revelations, insights and struggles in the way that we do. Many assume that Jesus knew everything and was just God playing at man but the act of kenosis is akin to someone with six numbers in the lottery putting it in the bin - He really was man and so the, "Well He was God wasn't He?" comments fall to the ground because although He was (and is) he was truly man and so His obedience and ministry is in so very many ways the same as that which is open to every one of us. So, three questions for us and these relate to our corporate (Church) life and our personal too. It is easy to feel God is with us when things are going right but when the going gets tough and the parish share is building up and the members are growing down or the health or job prospects or wealth are tested and the car has broken down - then that question, ‘Is the Lord among us or not?’, becomes a very real and most challenging one. Add to this the fact that it's easy for us to be happy Christians when we have few needs but the question that needs to be answered is simple: "Are you happy because you are Christ's - comforted by His love and one with the Holy Spirit?" This is a tough one because, following on from the first question it causes us to examine whether relationship with God is the source of our happiness or not - and sometimes the answer (if we are honest) is perhaps not what we'd claim. The final shot is obviously the most challenging for many because many I meet talk a game that says "I'm willing to do the stuff," and yet the reality is that they don't do it! Is this you? Do you say you'll be at a service and then fail to appear (always, of course, with the good reason!) or make positive noises about church things but are never there to be counted when the work is being done? This question: "Which son are you?" is perhaps the most telling and the hardest to own up to. Letting our 'yes be yes' and our 'no be no' is a key element. and to live in the joy that that reality brings. And pray for those who bear your name across the world. help us in our unbelief and fill us with your Spirit. Amen. I will open my mouth in a parable; I will pour forth mysteries from of old, Such as we have heard and known, which our forebears have told us. We will not hide from their children, but will recount to generations to come, the praises of the Lord and his power and the wonderful works he has done. For he did marvellous things in the sight of their forebears, in the land of Egypt, in the field of Zoan. He divided the sea and let them pass through; he made the waters stand still in a heap. He led them with a cloud by day and all the night through with a blaze of fire. He split the hard rocks in the wilderness and gave them drink as from the great deep. 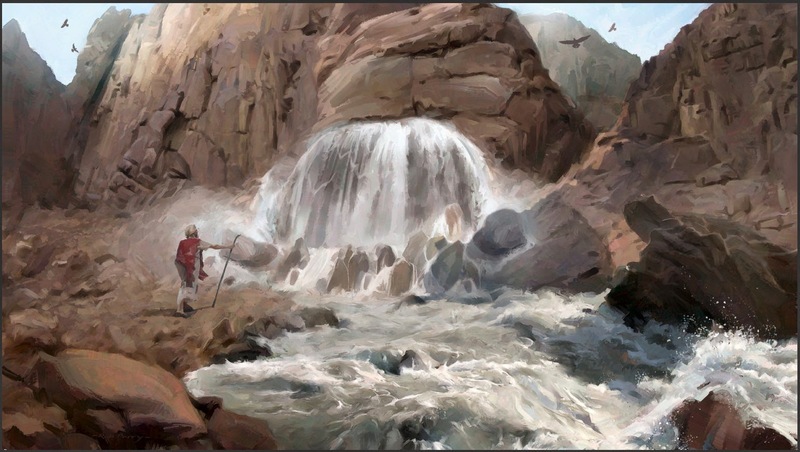 He brought streams out of the rock and made water gush out like rivers. If then there is any encouragement in Christ, any consolation from love, any sharing in the Spirit, any compassion and sympathy, make my joy complete: be of the same mind, having the same love, being in full accord and of one mind. Do nothing from selfish ambition or conceit, but in humility regard others as better than yourselves. Let each of you look not to your own interests, but to the interests of others. Let the same mind be in you that was in Christ Jesus, who, though he was in the form of God, did not regard equality with God as something to be exploited, but emptied himself, taking the form of a slave, being born in human likeness. And being found in human form, he humbled himself and became obedient to the point of death - even death on a cross. Therefore God also highly exalted him and gave him the name that is above every name, so that at the name of Jesus every knee should bend, in heaven and on earth and under the earth, and every tongue should confess that Jesus Christ is Lord, to the glory of God the Father. ‘What do you think? A man had two sons; he went to the first and said, “Son, go and work in the vineyard today.” He answered, “I will not”; but later he changed his mind and went. The father went to the second and said the same; and he answered, “I go, sir”; but he did not go. Which of the two did the will of his father?’ They said, ‘The first.’ Jesus said to them, ‘Truly I tell you, the tax-collectors and the prostitutes are going into the kingdom of God ahead of you. For John came to you in the way of righteousness and you did not believe him, but the tax-collectors and the prostitutes believed him; and even after you saw it, you did not change your minds and believe him. Recent conversations with friends, colleagues, clergy and the bloke who stopped me and asked how long we got before the Bishop 'moved us' have all included (with varying degrees of knowledge) the issue of the clergy vacancy. The expectations cover all stages from totally unrealistic through to, "Yeah, in your dreams," and yet some of the most unrealistic were from within the church and from those who should perhaps know better! There have been some interesting trends and some constructive thinking over the past few years. One involved asking clergy whether they'd be happy to note down the time that school work took and that which related to church schools was work and all other was effectively our hobby (I kid you not). This was repeated over a number of areas (church club = work, veteran's club = hobby and so on) and the end result was that a good idea of what should be paid for by the church and what was merely 'our personal interest' could be separated. When I was asked what I thought the Church should be paying for, the response was simple = everything! The reasoning for my response comes from the fact that there are some who appear to be looking to reduce the role of minister to something that resembles the sessional youth worker! Where we have a service that demands the presence of a priest, which usually means that an epiclesis* is involved, we budget for one and in so doing restrict our priestly requirement to Communion, marriage and (for some places) Baptism**! So we pay for the presence of priest on Sunday and then, realising, we need one for the Wednesday midweek communion service and subsequent home communions to those who otherwise couldn't make it add another day to the pile. This done, we add to the mix another day to enable hospital visits and other 'Vicar' type stuff (Vestry hour, meeting Wardens, parishioners and the like) and bingo, that's the 0.5 post put to bed. And so, with that, I'll leave you to have a reflect on this first shot. A shot that builds nicely upon the question of giving to God that for which we have not paid and asks where is our treasure? For that is surely the key to much of this issue. * epiclesis - an invocation or calling down upon or blessing involving the Holy Spirit. This is the bit where we bless people at the end or consecrate the bread and wine or bless the rings or the couple or the water in which (or which will be poured over to enable) the rite of baptism. ** when I was ordained, baptism was not allowed until I'd been priested and so this was a 'priest's job' - that said I have found many handing this over to deacons and I've heard of some who have allowed their Lay Minister's to do the service too (which is still, as I understand it, wrong). Your hand shall mark down all your enemies; your right hand will find out those who hate you. You will make them like a fiery oven in the time of your wrath; the Lord will swallow them up in his anger and the fire will consume them. Their fruit you will root out of the land and their seed from among its inhabitants. Because they intend evil against you and devise wicked schemes which they cannot perform, You will put them to flight when you aim your bow at their faces. Be exalted, O Lord, in your own might; we will make music and sing of your power. Then Solomon assembled the elders of Israel and all the heads of the tribes, the leaders of the ancestral houses of the Israelites, before King Solomon in Jerusalem, to bring up the ark of the covenant of the Lord out of the city of David, which is Zion. All the people of Israel assembled to King Solomon at the festival in the month Ethanim, which is the seventh month. And all the elders of Israel came, and the priests carried the ark. So they brought up the ark of the Lord, the tent of meeting, and all the holy vessels that were in the tent; the priests and the Levites brought them up. King Solomon and all the congregation of Israel, who had assembled before him, were with him before the ark, sacrificing so many sheep and oxen that they could not be counted or numbered. Then the priests brought the ark of the covenant of the Lord to its place, in the inner sanctuary of the house, in the most holy place, underneath the wings of the cherubim. For the cherubim spread out their wings over the place of the ark, so that the cherubim made a covering above the ark and its poles. The poles were so long that the ends of the poles were seen from the holy place in front of the inner sanctuary; but they could not be seen from outside; they are there to this day. There was nothing in the ark except the two tablets of stone that Moses had placed there at Horeb, where the Lord made a covenant with the Israelites, when they came out of the land of Egypt. And when the priests came out of the holy place, a cloud filled the house of the Lord, so that the priests could not stand to minister because of the cloud; for the glory of the Lord filled the house of the Lord. After some days Paul said to Barnabas, ‘Come, let us return and visit the believers in every city where we proclaimed the word of the Lord and see how they are doing.’ Barnabas wanted to take with them John called Mark. But Paul decided not to take with them one who had deserted them in Pamphylia and had not accompanied them in the work. The disagreement became so sharp that they parted company; Barnabas took Mark with him and sailed away to Cyprus. But Paul chose Silas and set out, the believers commending him to the grace of the Lord. He went through Syria and Cilicia, strengthening the churches. 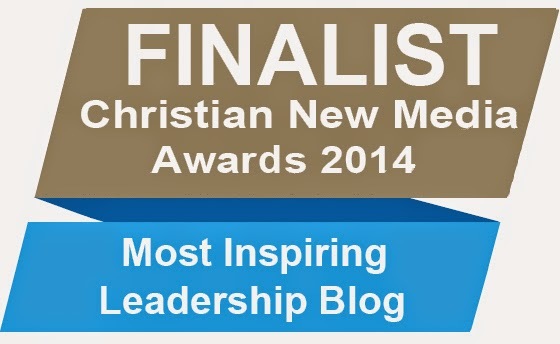 Yesterday I received an email which last year left me a little confused and a bit stunned as it told me that I have been shortlisted as one of the finalists in the 'Most Inspiring Leadership Blog' category of the Christian New Media Awards . Last year I was rather sad to find that the day it all happened was that before Remembrance Sunday (when for many reasons I am extremely busy) - this year, being the week before Remembrance Sunday (Saturday 1st November), I am hoping to be able to make it because the sessions on offer during the day are rather immense and extremely useful. 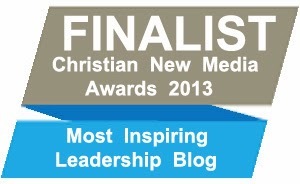 * I have to add that last year I was a little embarrassed by it and this I am rather pleased because it gives me a chance to get criticism and comment about my scruffy scribbling and manic mutterings and this can only be positive and constructive on a number of levels (and 'Yes' I would like to win it!). Seems someone has their head switched on when it comes to reading matter and what is required after reading some books. 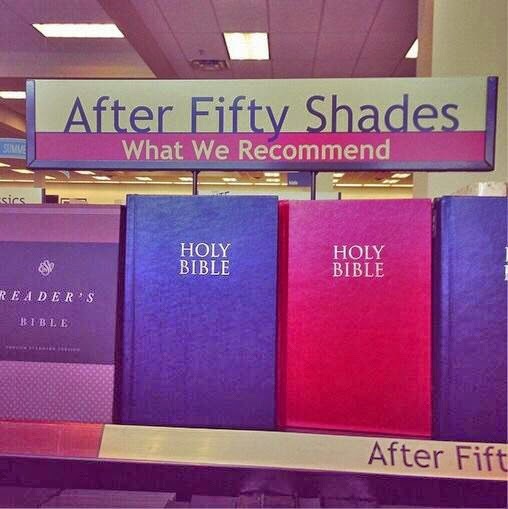 Perhaps they could add some copies to the top shelves of the magazine racks too! I call upon you, O God, for you will answer me; incline your ear to me, and listen to my words. Show me your marvellous loving-kindness, O Saviour of those who take refuge at your right hand from those who rise up against them. Keep me as the apple of your eye; hide me under the shadow of your wings. From the wicked who assault me, from my enemies who surround me to take away my life. They have closed their heart to pity and their mouth speaks proud things. They press me hard, they surround me on every side, watching how they may cast me to the ground, Like a lion that is greedy for its prey, like a young lion lurking in secret places. The fear of the Lord is clean and endures for ever; the judgements of the Lord are true and righteous altogether. More to be desired are they than gold, more than much fine gold, sweeter also than honey, dripping from the honeycomb. By them also is your servant taught and in keeping them there is great reward. Who can tell how often they offend? In the four hundred and eightieth year after the Israelites came out of the land of Egypt, in the fourth year of Solomon’s reign over Israel, in the month of Ziv, which is the second month, he began to build the house of the Lord. So Solomon built the house, and finished it. He lined the walls of the house on the inside with boards of cedar; from the floor of the house to the rafters of the ceiling, he covered them on the inside with wood; and he covered the floor of the house with boards of cypress. He built twenty cubits of the rear of the house with boards of cedar from the floor to the rafters, and he built this within as an inner sanctuary, as the most holy place. The house, that is, the nave in front of the inner sanctuary, was forty cubits long. The cedar within the house had carvings of gourds and open flowers; all was cedar, no stone was seen. The inner sanctuary he prepared in the innermost part of the house, to set there the ark of the covenant of the Lord. The interior of the inner sanctuary was twenty cubits long, twenty cubits wide, and twenty cubits high; he overlaid it with pure gold. He also overlaid the altar with cedar. Solomon overlaid the inside of the house with pure gold, then he drew chains of gold across, in front of the inner sanctuary, and overlaid it with gold. Next he overlaid the whole house with gold, in order that the whole house might be perfect; even the whole altar that belonged to the inner sanctuary he overlaid with gold. In the inner sanctuary he made two cherubim of olive wood, each ten cubits high. Five cubits was the length of one wing of the cherub, and five cubits the length of the other wing of the cherub; it was ten cubits from the tip of one wing to the tip of the other. The other cherub also measured ten cubits; both cherubim had the same measure and the same form. The height of one cherub was ten cubits, and so was that of the other cherub. He put the cherubim in the innermost part of the house; the wings of the cherubim were spread out so that a wing of one was touching one wall, and a wing of the other cherub was touching the other wall; their other wings towards the centre of the house were touching wing to wing. He also overlaid the cherubim with gold. So they were sent off and went down to Antioch. When they gathered the congregation together, they delivered the letter. When its members read it, they rejoiced at the exhortation. Judas and Silas, who were themselves prophets, said much to encourage and strengthen the believers. After they had been there for some time, they were sent off in peace by the believers to those who had sent them. But Paul and Barnabas remained in Antioch, and there, with many others, they taught and proclaimed the word of the Lord. Presenting to God that which has cost me nothing. I met someone this week who asked me about the free tea, coffee and cake sessions we put on in the church building on Monday and Thursday morning. They were confused by the word 'free' because this didn't make sense to them unless of course it meant payment was in kind rather than coins and they were assuming that the kind looked like them coming to our church. "No, you don't have to come to our church to come in and have a cup of tea or coffee and some biscuits or cake," I said, "We do it because Jesus came to serve and we, wanting to be like Him, are merely doing the same." Their response was, "But I sometimes go to nnnnnn church, so doesn't that mean I have to pay?" Back came the standard response, "No, it's free, we do it because it provide people with the potential for community and makes a lonely existence less lonely. Regardless of whether you come to this church or not, there is no charge!" The conversation moved on to another well worn track regarding the joint difficulty people have in receiving stuff for nothing and the Church has in providing the stuff without sticking out its begging bowl. The former being known as 'Grace' and the latter servanthood and ministry - very important concepts that we need to engender and exhibit within our church congregations and deliver to all we meet. Far too often we worry about making ends meet for the services we provide and attempt to address the shortfall by asking those who avail themselves of them to 'pay up'. I Recently took part in an occasional office (baptism, wedding or funeral) where, at the conclusion of the service, those leaving the building faced something that was, to be quite brutal, only a few degrees short of a mugging! To cap it all, walking into the vestry after the service, I found the two 'muggers' counting their spoil and, as they did, they complained abut the paucity of cash on the plate. I tried to explain how the money to pay for the services we offer (generally) came from the members of that church. I say 'generally" because some time back I provided something visually appealing and value-added on the understanding that the group we were doing the service for would pay for the means of enhancing it and all I can say is that I'm glad I never held my breath - so there are exceptions to the rule (aren't there always?). The response to this was amazing, seems some people in Church can get energised and passionate after all - just a pity it isn't about the Gospel! The reason we (the Church) exists is to reconcile us (that's you and me and them who aren't us) and God by means of the Cross of Jesus, the Christ. We seek to live as signposts to the love of God (again as shown through Christ) and the all-embracing and all-encompassing acceptance that is the Gospel (of love and Grace). This is a freewill act of offering ourselves as servants, sacrificially at times (just like Jesus and His giving of Himself), to change the lives of those around us and to demonstrate (words can be used, but perhaps a little more sparingly (YAWN) than is usual) the reality of finding faith in, and peace through, Jesus. 1. Are we meeting the needs of those around us (we do know what they need don't we?)? 2. Are we exciting people around us to get involved, opening our doors and getting out there (leaving the doors open for those who come (and they will - not immediately - but they will)? 3. Are we doing stuff because it's who we are rather than as a bait to entice people into the trap? I have set the Lord always before me; he is at my right hand; I shall not fall. Wherefore my heart is glad and my spirit rejoices; my flesh also shall rest secure. For you will not abandon my soul to Death, nor suffer your faithful one to see the Pit. You will show me the path of life; in your presence is the fullness of joy and in your right hand are pleasures for evermore. God gave Solomon very great wisdom, discernment, and breadth of understanding as vast as the sand on the seashore, so that Solomon’s wisdom surpassed the wisdom of all the people of the east, and all the wisdom of Egypt. He was wiser than anyone else, wiser than Ethan the Ezrahite, and Heman, Calcol, and Darda, children of Mahol; his fame spread throughout all the surrounding nations. He composed three thousand proverbs, and his songs numbered a thousand and five. He would speak of trees, from the cedar that is in the Lebanon to the hyssop that grows in the wall; he would speak of animals, and birds, and reptiles, and fish. People came from all the nations to hear the wisdom of Solomon; they came from all the kings of the earth who had heard of his wisdom. When Hiram heard the words of Solomon, he rejoiced greatly, and said, ‘Blessed be the Lord today, who has given to David a wise son to be over this great people.’ Hiram sent word to Solomon, ‘I have heard the message that you have sent to me; I will fulfil all your needs in the matter of cedar and cypress timber. My servants shall bring it down to the sea from the Lebanon; I will make it into rafts to go by sea to the place you indicate. I will have them broken up there for you to take away. And you shall meet my needs by providing food for my household.’ So Hiram supplied Solomon’s every need for timber of cedar and cypress. Solomon in turn gave Hiram twenty thousand cors of wheat as food for his household, and twenty cors of fine oil. Solomon gave this to Hiram year by year. So the Lord gave Solomon wisdom, as he promised him. There was peace between Hiram and Solomon; and the two of them made a treaty. O do good to your servant that I may live, and so shall I keep your word.Open my eyes, that I may see the wonders of your law. I am a stranger upon earth; hide not your commandments from me. My soul is consumed at all times with fervent longing for your judgements. You have rebuked the arrogant; cursed are those who stray from your commandments. Turn from me shame and rebuke, for I have kept your testimonies. Rulers also sit and speak against me, but your servant meditates on your statutes. For your testimonies are my delight; they are my faithful counsellors. O Lord, rebuke me not in your wrath; neither chasten me in your fierce anger. Have mercy on me, Lord, for I am weak; Lord, heal me, for my bones are racked. My soul also shakes with terror; how long, O Lord, how long? Turn again, O Lord, and deliver my soul; save me for your loving mercy’s sake. For in death no one remembers you; and who can give you thanks in the grave? I am weary with my groaning; every night I drench my pillow and flood my bed with my tears. My eyes are wasted with grief and worn away because of all my enemies. Depart from me, all you that do evil, for the Lord has heard the voice of my weeping. The Lord has heard my supplication; the Lord will receive my prayer. in the unity of the Holy Spirit. one God, now and for ever. Amen. To those who read this blog piece on a regular basis I have to apologise for its omission over the past two Sundays - the first Sunday saw me in France and out of internet communication and the second I was in bed with a kidney infection thing! The Lord builds up Jerusalem and gathers together the outcasts of Israel. He heals the brokenhearted and binds up all their wounds. Great is our Lord and mighty in power; his wisdom is beyond all telling. The Lord lifts up the poor, but casts down the wicked to the ground. Apointed for man to live once . . .
Golgotha: A place of trouble? Hello Vicar, "I've sort of lost my doubt!" Blue Sky Thinking - Almost Saved! Israel - Not the best at marketing!